Summary STORKS is an animated film about storks who have stopped delivering babies and now deliver mail order items. 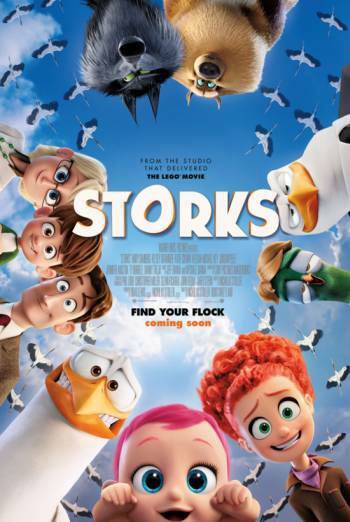 STORKS is an animated film about storks who have stopped delivering babies and now deliver mail order items. It is preceded by THE MASTER, a short animated film featuring Lego characters about an old martial arts master and a chicken that also becomes adept at martial arts. STORKS features several moments of mild violence in which characters are struck with objects, but this is presented in a slapstick style and no realistic injury is caused. Other slapstick action includes storks crashing into windows, being trapped in machinery and being chased by aeroplanes, although there are no harmful consequences. In one scene, a stork produces a knife, but not for use as a weapon. There are also moments of mild threat, such as characters being surrounded by a pack of wolves who then hold them prisoner and threaten to eat them. There is no nasty outcome, but rather a comic resolution to the situation. THE MASTER features very mild slapstick violence as the martial arts master kicks the chicken, throws it across a room and fights several wooden training dummies that have come to life. STORKS includes very mild bad language, including uses of 'bummer' and 'screw up'. STORKS also includes some mild rude humour, such as a steam of liquid hitting a stork when a baby urinates while being carried.